Does art create a people? 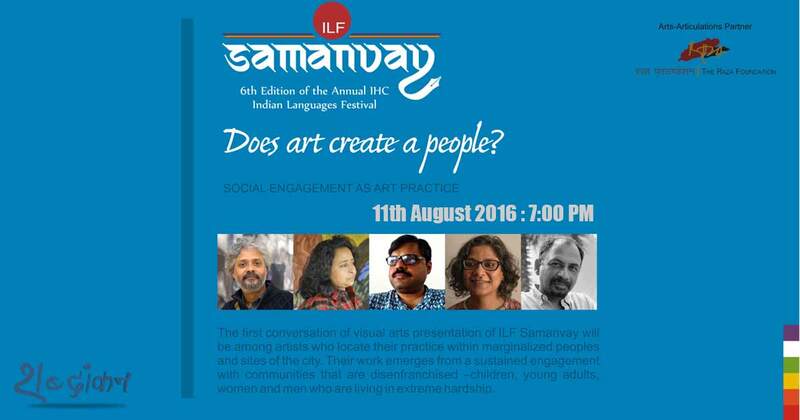 The first conversation of Art Articulations, the visual arts presentation of ILF Samanvay will be among artists who locate their practice within marginalized peoples and sites of the city. Their work emerges from a sustained engagement with communities that are disenfranchised – children, young adults, women and men who are living in extreme hardship. Over the course of the evening the artists will present their work and together we will all ponder the question of aesthetics in socially engaged practices. We will learn the ways in which art can facilitate dialogue and change and the strategies employed by artists to reach their goals of public action, community engagement and enhancement. An artist and activist, he uses socio-cultural concerns to create installations and community-engaging art. Engaging extensively with under-privileged communities and policy makers, Probir works towards sensitising the world around him to human trafficking and violence against women. One half of the Revue collective, Sreejata is involved largely with politics of space and living conditions. She collaborates with young adults in low-income colonies in New Delhi through a variety of art practices. The other half of the Revue Collective, Mrityunjay is interested in public domain and popular print culture. Through his work, he engages with homeless women and explores the idea of women in public spaces. Socially-engaged art forms the backbone of her art practice. Aastha’s art practice is rooted in n the urban village of Khirkee, where she focuses on projects dealing with urban design and redevelopment. The founder of the Indian environmental NGO Toxics Link is an artist, environmental activist, writer and curator. Through the NGO he has pioneered work on waste and chemicals in India.